Justice and Development Party (AKP) İzmir deputy Hüseyin Kocabıyık has said the Turkish people will raid prisons and hang sympathizers of the Gülen movement and the Kurdistan Workers’ Party (PKK) in the event of the assassination of high-ranking state officials. 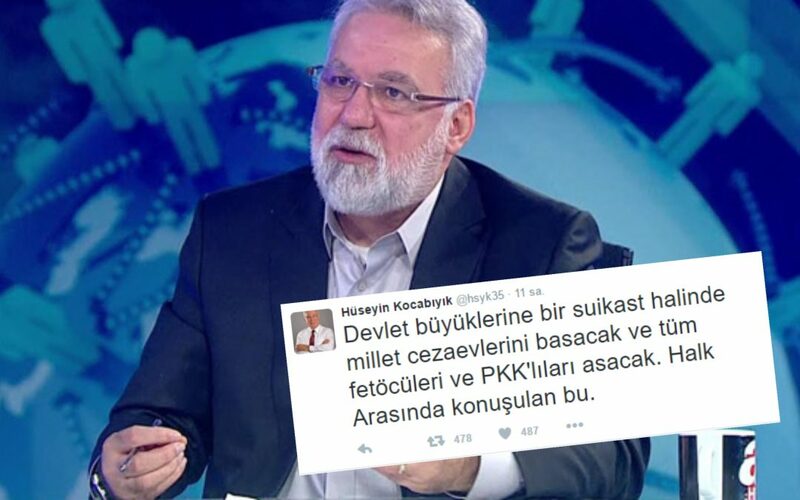 Kocabıyık made the controversial remarks in a Twitter message he posted on Sunday. “In the event of assassination of high-ranking state officials, the people will raid prisons and hang all FETÖ and PKK supporters. This is what is spoken among the public,” he wrote. FETÖ is a derogatory term and acronym for the Fethullahist Terrorist Organization, coined by President Recep Tayyip Erdoğan and the AKP government to refer to the Gülen movement, which Erdoğan and the AKP accuse of masterminding a failed coup attempt on July 15. The movement strongly denies having any role in the coup attempt. More than 110,000 people have been purged from state bodies, in excess of 80,000 detained and over 36,000 have been arrested since the coup attempt for alleged Gülen links. Arrestees include journalists, judges, prosecutors, police and military officers, academics, governors and even a comedian. Critics argue that lists of Gülen sympathizers were drawn up prior to the coup attempt. The controversial remarks of the AKP deputy came at a time when the Turkish government is considering to reintroduce death penalty and there are reports about plans to kill real or alleged supporters of the Gülen movement in prisons. Ömer Turanlı, a lawyer representing a former police chief imprisoned as part of a crackdown against the movement, claimed last week that the Turkish government is headed for mass killings of people jailed over alleged or real links to the Gülen movement, in a staged riot in Silivri Prison. “According to unconfirmed information my clients received from their families, officials will open the gates [of holding cells] in order for prisoners to escape as if in a prison break. And then soldiers will be ordered to shoot them,” lawyer Ömer Turanlı tweeted. In September a pro-Justice and Development Party (AKP) Twitter troll named Ahmet Üstün (@ustunn_ahmet) called on the government to make plans for the massacre of all Gülen sympathizers who are currently behind bars.